It has been another gloriously hot day. Philip mowed for about 3 hours early this morning. After breakfast we spread all the hay on the field, then hosted a very enjoyable visit from the Dyfed Smallholders Association. 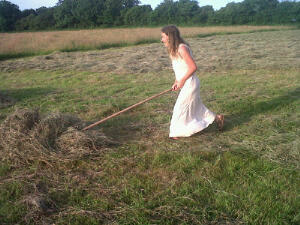 This evening we carted the hay that had been mown on Thursday, then rowed up the rest of the hay for the night. Hand hay making all begins with a scythe of course, but there are a couple of other important “tools of the trade” as shown in the pictures below. 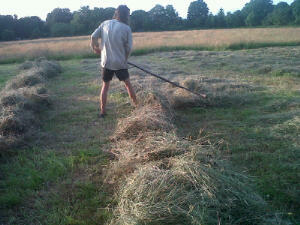 We use pitchforks for spreading hay from rows, turning, lifting or moving hay about eg up onto haystacks. We use wooden hay rakes for rowing up, gathering spread hay into piles and for “rolling” rows, when we do not want to spread the hay but do want to turn the rows to expose the greener underside. 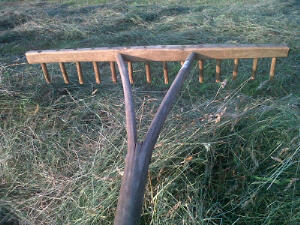 We also use hay racks to cure hay in less then ideal weather conditions. With the weather holding fair so far there has been no need to use them. I hope to post some pictures on their construction and use soon. 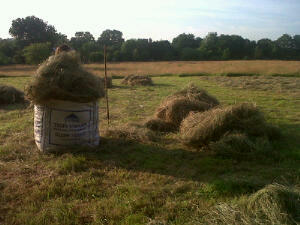 For links to more information on how we make hay, see our hay making information page. 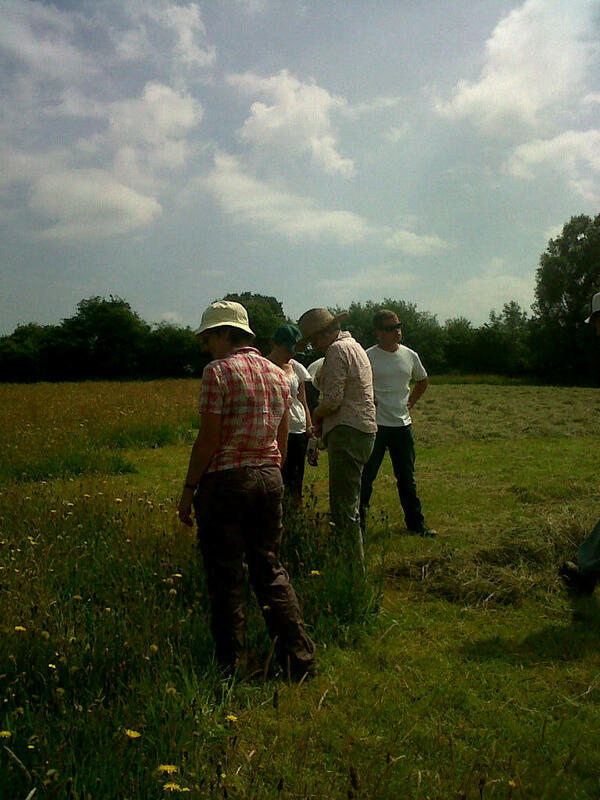 Members of the Dyfed Smallholders Association identifying flowers in the uncut grass. 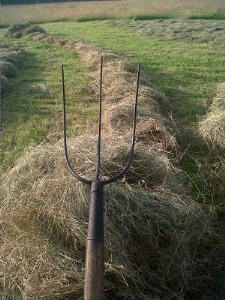 Unusual 3-pronged pitchfork we found on a recent trip to Cornwall.